Educators will need to supply their own context for this animation. The resource doesn't address the title "Missing Carbon," so it's suggested that the focus of this video is just on the changes of atmospheric CO2. 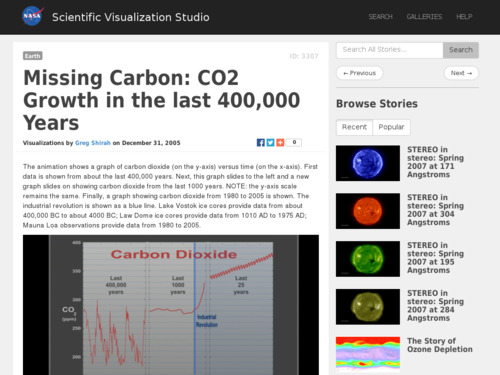 A short animation that shows how carbon dioxide in the atmosphere has fluctuated over time. Comments from expert scientist: This is a very nice animation showing the atmospheric CO2 concentrations as measured at Mauna Loa and reconstructed from ice cores. It requires background and introductory instruction prior to use. Does not work as a stand alone resource. This simple presentation makes it clear that the rise of atmospheric CO2 since the industrial revolution is extraordinary. There is no background material accompanying this animation, no information on the details of how these data were developed. The animation plays for 15.0 seconds and the downloads are 7-11MB.